Mayor Vincent Gray, City Administrator Allen Y. Lew, and DDOT Director Terry Bellamy want to expand DC’s green infrastructure wisely. DDOT staff and partners learn as they move to change DC’s impervious urban design — which could prove a blessing for managing stormwater. Streets, roads, sidewalks, and alleys account for almost half of all impervious surface in the District of Columbia1 (with DDOT responsible for all but a small, federal fraction). DDOT paves and manages far more impervious area in DC than anybody else. In this pie chart of all DC impervious areas, the biggest, blue slice is roads, etc.2 (almost half the whole pie); the smaller, red slice is all the buildings; green is all the parking lots; and purple is everything else (e.g., private driveways). DDOT manages virtually all of that “Roads, etc.” slice by itself. In contrast, buildings have tens of thousands of owners; parking lots have hundreds. 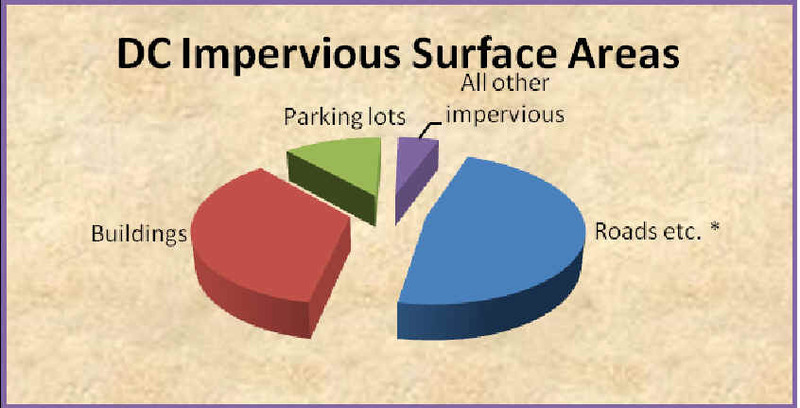 Impervious areas managed by DDOT cause runoff, overflows, and billions of dollars of remediation costs for which everyone else pays almost $300 per impervious acre per month. But DDOT pays nothing, and, I fear, may not think about these costs — identified as “externalities” by economists. DDOT must be key to reducing run off from impervious areas just because of its share of such areas. DDOT’s deepening expertise could advance both quality of life and sensible management of storm water run off. DDOT is learning about what works and what it costs to change pavement because a DC law3 directs DDOT to promote Low Impact Development projects (LIDs), such as rain gardens and porous sidewalks and allets, in the public space.4 By its engineering of pilot LIDs, DDOT can test cost-effectiveness and how to avoid unintended consequences.5 DDOT issued an LID Action Plan in 2010.6 Using ARRA funds, DDOT removed three impervious acres during the past couple of years.7 That same DC law calls for improved regulation by DDOT of other people’s projects in the public space. People living in DC and businesses located here can benefit if less rainwater runs off into sewers from DDOT’s impervious surfaces and more of that rainwater soaks into the ground or evaporates (or is “harvested” and used) — enhancing our environment with healthy shade trees, attractive flora, and fewer floods, and addressing federal Clean Water Act mandates to reduce pollution of surface waters. These are good goals. They may complement or compete with one another. Goals, perspectives and priorities differ. DC Water is trying to get U.S. EPA to support re-opening a court order to give time for rigorous exploration of green technologies as alternatives to some deep, costly storage tunnels. DC Water wants a few years to try out a variety of projects on a very large scale — projects that capture rainwater for human use as well as LIDs. DC Water points to Philadelphia’s Green City, Clean Waters plan — to test and install many green infrastructure measures that could capture pollutants. Philadelphia would thereby side-step building storage tunnel structures. EPA’s regional regulators (based, ironically, in Philadelphia) are resisting DC Water. To convince EPA, DC Water will want to show that DDOT would permit DC Water green projects to be built on and under sidewalks — for one example — even though they compete with other uses of that DDOT-managed public space, including uses for DDOT LIDs. DC Water focuses its proposals for intensive “exploration” — or trials — on less than 10 percent of the total land in the District — 20 percent of DC’s impervious area. DDOE wants to comply with a new EPA discharge permit which requires some LIDs, such as planting trees or enlarging tree boxes. DDOE focuses on two-thirds of the total land in the District but only half of the impervious area. DDOE measures attack pollutants carried by “first flush” of rainwater. DDOT, including its Urban Forestry Administration, focuses on streetscape, particularly as it comes time to repave streets. Its pace and priorities are geared to funding limitations, not DC Water’s struggle with EPA inflexibility. DDOT’s green infrastructure initiatives face daunting costs and challenges. DDOT reports higher costs for LIDs as compared with traditional paving.9 I wonder: How much higher seems justified to DDOT? Does the answer turn on funding source? Can DDOT get costs down? What can we learn from other jurisdictions? (Montgomery County, MD, has saved time and money by coordinating DOT and DEP efforts.) Early efforts require site-specific designs for each greening project. As DDOT (and others) gain experience, will standardized design templates be feasible for parts of each project? How can DDOT leverage the private sector to bear costs for more projects, without public funds? Developers of properties sometimes install — and commit to maintain — green infrastructure in adjacent public space. They may look, in return, for clarity of DDOT regulatory policies and predictability and timeliness of their implementation. DC Water seeks to re-open a judicial consent decree for two of the areas of the City with combined sewers designed to handle both sanitary sewage and rainwater ("CSO areas") to allow for large-scale exploration of green development technologies as an alternative (or complement) to storage tunnel systems for CSO areas in the Potomac River and Rock Creek watersheds (but not in the Anacostia River watershed). DC Water priorities and timetables differ from current pace and locations of DDOT (and DDOE) work. Executive Branch coordination is essential. The Executive Branch must coordinate its components, DDOT, DDOE, and DC Water — as well as DCRA and the Office of Planning — to avoid working at cross purposes, even unwittingly. Whether DC Water succeeds in re-opening its consent decree or not, it is vital to assure that pertinent Executive Branch components intensively coordinate their efforts and priorities. Coordination demands respect for what each part of the Executive Branch tries to accomplish and an understanding of how to determine success. “MS4 areas” have separate sewers for rainwater and sanitary sewage. “CSO areas” do not with all Executive Branch components, DDOT, DDOE, DC Water, and the others asked to take a seat at the table. seat at the table. The District should fully engage DDOT’s, DDOE’s, and DC Water’s creative enthusiasm and professionalism so as to achieve common benefits for all. 1. 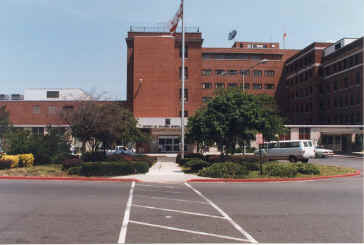 David Bardin served on DC Water’s Board of Directors from 2001-2011. This paper derives from his testimony and six-page submittal to the DC Council, Committee on Environment, Public Works, and Transportation (“the Committee”) for its March 2, 2012, Annual DDOT oversight hearing. "(7) Costs for each recommendation and a recommended timeline for funding in the Mayor’s proposed budget. The Mayor shall incorporate these recommendations in the next and subsequent proposed annual budgets. 4. The DC law defines “Low Impact Development” as “stormwater management practices that mimic site hydrology under natural conditions, by using design techniques in construction and development that store, infiltrate, evaporate, detain, or reuse and recycle runoff.” DDOT landscapes LIDs. 5. See recent engineering drawings posted at http://tinyurl.com/riversmartchevy and http://tinyurl.com/riversmartchevy2 by DDOT for measures about to be started and “City to pilot stormwater project in Chevy Chase; Environment: Grant will fund permeable alleys, more,” Northwest Current, February 8, 2012, page 1. Measures include rain gardens in “bumps” extending from sidewalk, as well as “green alleys,” among others. 8. Mayor Gray’s Sustainable DC plan, being developed by DDOE and OP, will include a strong emphasis on using green programs to grow green businesses and jobs in the District. 9. See thoughtful DDOT answers to the Committee’s oversight questions §§ 10.3 (Green alley initiative), 10.4 (Stormwater runoff reduction), 11.1 (Design standards), 11.2 (Green streets and alleys), 11.3 (Private development in public space), 11.4 (Statutory changes), posted on DC Council’s web site. 10. DDOT’s preeminent share of all impervious surface area in the District drives up Clean Water Act remediation costs that Clean Rivers IACs must cover — sending price signals to others, but not DDOT. (1) Total area (33,779.9 acres) excludes open water and undisturbed parkland. It represents "developed" areas of DC.